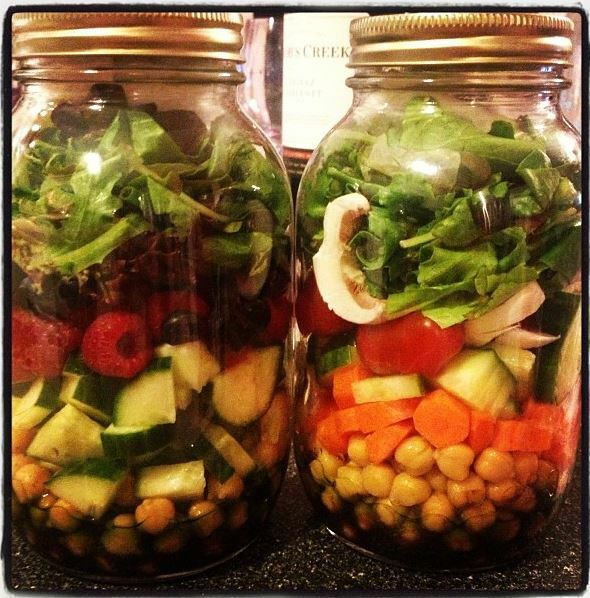 Salad in a Jar – The Small Things. This is revolutionary. Seriously, lunch at the office just got a whole lot healthier. Do you ever stand in front of your open fridge thinking “I should have a healthy salad for lunch… but the lettuce leaves will be all wilted from the dressing by lunch. ew. I’ll just take this Tupperware container filled with spaghetti instead…” Because I do. A lot. Sometimes preparing a salad seems like a lot of work in the morning and its especially disappointing when you do go to all that work and end up eating a soggy, wilted salad at lunch time. So more often than not I eat the left over pasta. Maybe it’s because I live with Italians but there is almost always some left over pasta in the fridge. I had resolved to a lifetime of timmy’s bagels and wilted salad when pinterest helped me to stumble across this gem of an image. There you have it folks, salad in a damn jar. If you’re still not sure why this is such a big deal, let me tell you. The dressing goes in first and therefore sits on the bottom of the jar. The hearty bits go in second, heavy veggies and such. The lighter bits or softer veggies, nuts, seeds, cheeses, ect. go in after that. Finally, the lettuce goes on top. Pack the lettuce in there real tight. If there is some extra space fold up some paper towel and pop it in the top before you put on the lid (this helps absorb extra moisture). 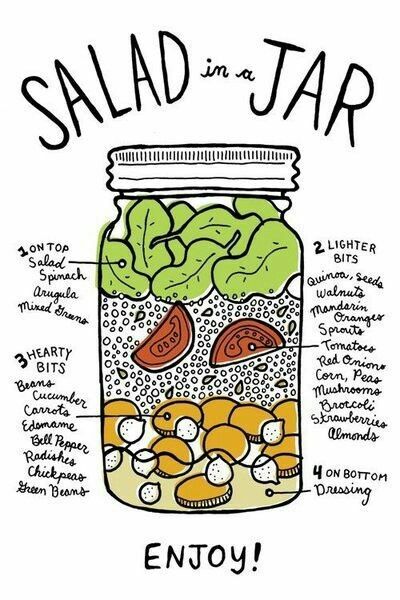 Now all you need to do is keep that jar up straight and your lettuce wont wilt. I’m sorry, did yo get that? YOUR LETTUCE WONT WILT!!! Putting everything in an airtight jar keeps it fresh and wilt free. As I said earlier, revolutionary. Then when you get to work dump the contents of your jar into a bowl and enjoy! I’ve had 3 jar salads this week, each with different veggies and dressings. I prefer to use smaller jars and bring something else as well, soup or a sandwich or something. But you could always use a bigger jar and have a bigger salad. The options are endless. What do you like to put in your salad? Share in the comments!